If you're bored with cooking the same dishes, try something different. Greek food combines fairly common ingredients in unique ways that yield deliciously satisfying results. 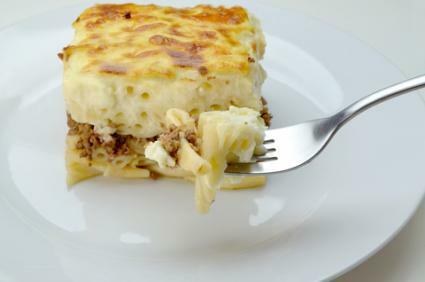 Pastitsio is a cheesy pasta and beef dish that has a seasoning twist. This recipe serves 4 to 6 people, depending on serving size. Cook the pasta according to the package directions. Rinse it in cold water and set it aside to drain. In a large skillet, combine the ground beef and onion. Cook them over medium high heat, stirring frequently, until the beef is browned and the onions are translucent. Drain the excess fat and then stir all four spices, sugar, tomato sauce, and water into the beef and onion mixture. Let it simmer for about 12 minutes before turning off the heat. Begin preheating the oven to 425 degrees Fahrenheit. While the oven preheats, start making the sauce. In a medium-size sauce pan, melt 1 stick of butter over medium-low heat. Whisk in 1 tablespoon of flour at a time until all the flour and butter are completely combined. Slowly pour the milk into the pan with the flour mixture, stirring constantly to prevent burning. Add the salt, turn the heat up to medium high, and bring the mixture to a boil, stirring constantly until the sauce begins to thicken. Remove the sauce from the heat and let it cool for about 10 minutes. Whisk in the eggs until they're fully incorporated into the sauce and set aside. In a large bowl, combine the pasta, the stick of melted butter, and the Parmesan cheese. Toss them together until they're thoroughly mixed. Coat a 9 x 13-inch casserole dish with non-stick cooking spray. Layer about 1/3 of the pasta in the bottom of the pan and then layer the ground beef mixture evenly over it. Top the beef mixture with the rest of the pasta and then pour the bechamel sauce evenly over the top. Let the pan sit for a few minutes so the sauce can sink in. Bake for about 45 minutes until the top turns golden. Let the casserole rest for about 10 minutes before serving. You can serve this dish by itself, but it pairs nicely with green beans and good bread with butter. Tabouli is a lemony chopped salad that is often served alongside Greek dishes and other Mediterranean foods, but its refreshing flavor also makes it a nice stand alone dish that's perfect for a light lunch. This recipe serves 4 to 6 people. In a mixing bowl, pour the water over the wheat, stir, and let the mix soak for 10 to 15 minutes. Drain off the excess water. Add the parsley, mint, tomato, onion and toss together. In a small bowl, stir together the lemon juice, olive oil, garlic and salt. Add the oil and lemon mixture to the wheat mixture and stir well. Cover and refrigerate for at least 8 hours to give time for the salad to chill and the flavors to blend. 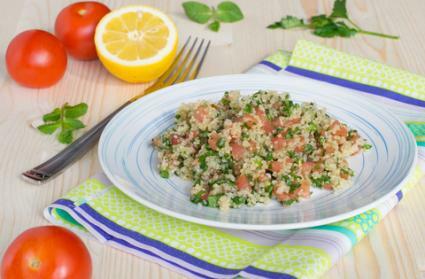 Serve the tabouli with fresh pita bread. Stuffed grape leaves are one of the most versatile foods in all of Greek cooking. They make a delicious appetizer, and they work equally well as a side dish served with pastitsio, moussaka, and other Greek dishes. You can even make them your main course and eat your fill. Meat stuffed grape leaves are traditionally made with a mixture of rice and ground beef or ground lamb. 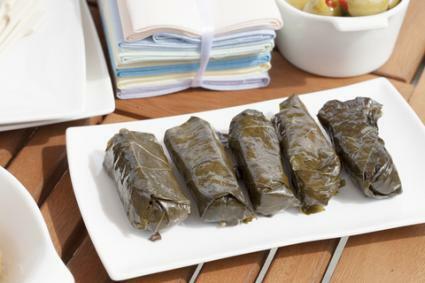 Vegetarian stuffed grape leaves, on the other hand, can be made with rice or lentils and a variety of finely chopped vegetables and herbs; you can get as creative as you like with your stuffing combinations. 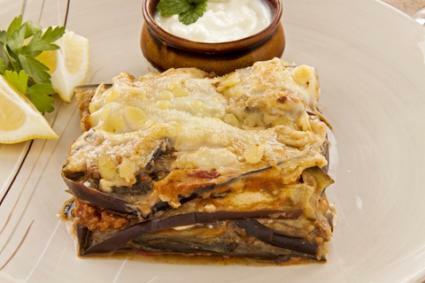 Moussaka, sometimes referred to as "Greek lasagna," is a heady blend of eggplant and meat topped with a creamy bechamel sauce that satisfies the soul. You can make a vegetarian version of this dish, but this recipe calls for meat and serves about 8 people. Slice the eggplants into approximately 1/4-inch slices. In a large skillet, brown the beef/lamb with the onions over medium-high heat and then stir in the basil, cinnamon, and salt. Add the tomato paste and wine and stir well. Bring the mixture to a simmer and let it continue simmering for about 10 minutes, stirring occasionally to prevent sticking. Turn off the heat. Begin preheating the oven to 375 degrees Fahrenheit. Coat a 9 x 13-inch casserole dish with non-stick cooking spray. Layer the bottom of the pan with half of the eggplant slices. Add a layer of half of the meat mixture over the eggplant, followed by 1/3 cup of Parmesan sprinkled evenly over the meat and 1/2 cup of bread crumbs sprinkled over the Parmesan. Repeat. In a large saucepan, melt the butter over medium-low heat to begin the sauce. Whisk in the flour 1 tablespoon at a time until well combined. Pour the milk in slowly as you whisk and continue whisking until the mixture thickens. Remove the pan from the heat and let it cool for about 10 minutes. Add the eggs and ricotta cheese to the milk mixture and stir until well combined. Pour the sauce evenly over the contents of the casserole dish and bake for approximately 1 hour or until the top turns golden brown. Let the moussaka cool for about 10 minutes before cutting and serving. This dish pairs well with Greek salad and stuffed grape leaves. Treat your family to something special by preparing these recipes in any combination you like. Play some Greek music softly in the background and give your family a little taste of Greece. Chance are good they'll want more.